The global finite element analysis is one of the most important segments of simulation and analysis market. Production of next generation automobiles and aerospace technology will be a key trend for the growth of finite element analysis software market. The automotive OEMs are aggressively developing new automobile and components design such as next-generation IC engines and exhaust systems to curb the vehicular emission and its impact on environment. FEA software is the most cost-effective and fastest way to develop new product while improving quality and reliability of the product. FEA software also eliminates the hassle of multiple prototypes, product recalls and consumption of material, which is the major advantage of FEA software that is driving its growth in R&D facilities across various industries around the world. Goldstein Research analyst forecast the global finite element analysis software market to expand at a CAGR of 9.1% during the forecast period 2016-2024. Further, the market is anticipated to reach USD 2.6 billion by the end of forecast period. The report covers the present ground scenario and the future growth prospects of the finite element analysis software market for 2016-2024 along with the total revenue of finite element analysis software industry in every region. We calculated the market size and revenue share on the basis of revenue generated per segment, regional and country level. The revenue forecast is given on the basis of number of finite element analysis Software companies and current growth rate of the market. Based on end users, automotive industry segment accounted for the maximum market share of 35% in 2016 and will continue to dominate the market during the forecast period. Moreover, FEA software market in electrical and electronics industry is projected to witness growth at a significant rate during the forecast period. Global Finite Element Analysis Software Market Outlook 2016-2024, has been prepared based on an in-depth market analysis from industry experts. The report covers the competitive landscape and current position of major players in the global finite element analysis software market. The report also includes porter’s five force model, SWOT analysis, company profiling, business strategies of market players and their business models. Global finite element analysis software market report also recognizes value chain analysis to understand the cost differentiation to provide competitive advantage to the existing and new entry players. 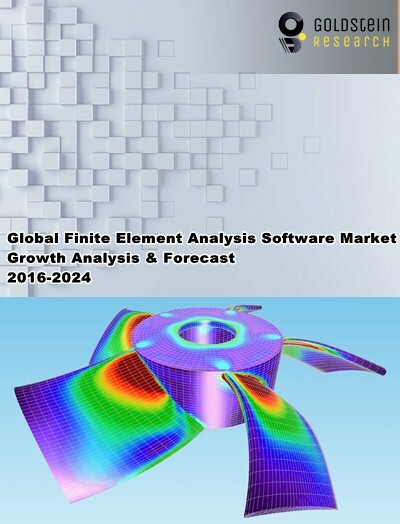 Our global finite element analysis software market report comprises of the following companies as the key players in the global finite element analysis software market: Ansys Inc., Dassault Systemes SA, LMS International NV, MSC Software Corp., Siemens PLM Software, Altair Engineering Inc., Blue Ridge Numerics Inc., Aspen Technology Ltd, ESI Group, COMSOL Inc., and NEi Software Inc. According to our global finite element analysis software market study on the basis of extensive primary and secondary research, one major trend in the market is the emergence of cloud and mobile-based FEA software which represents a major development in the FEA market, as it enables designers and programmers to access the software and collaborate on results with anyone and from anywhere across the globe. The deployment of FEA in cloud also leads to a reduction in cost, low maintenance, and increases scalability. According to the report, major driver in global finite element analysis software market is the introduction of new fabrication materials like shape-memory alloys (SMA’s) like Nitinol and composites like carbon-fiber-reinforced polymer (CFRP). These are some external events that can also affect engineering simulation software development. The introduction of new materials will push the software developers to exploit the opportunity in industries. Further, the report states that one challenge in global finite element analysis software market is the availability of open source software in the market. Additionally, FEA software vendors are fronting challenges from pirated and fake products in the market. Many pirated codes and product keys are also available to crack this software. Geographically, North America accounted for the largest market share with 32% revenue in global finite element analysis software market. Asia Pacific is anticipated to be the fastest growing region for FEA software market, at a CAGR of 12.4% during the forecast period attribute to the fastest growing and largest market for automotive industry. Moreover, China and India showcases immense growth opportunities owing to significant government initiative to accelerate the growth of manufacturing industries in respective countries.